It’s been another manic week. I’m just sitting on a train on the way back home from work, trying to write this so I can upload it when I get in, as otherwise it’ll never happen. On Monday D. had surgery to repair an umbilical hernia, so I’ve been busy playing nurse, as well as having a lot on at work. I shouldn’t complain though, it’s good to keep busy I guess, but it has thrown my normal routine out of whack a bit. There hasn’t been much cooking going on again this week and I have to admit that on the seat next to me I have a carrier bag containing two M&S pizzas, because all I want to do tonight is sit down on the sofa and watch the Masterchef Final and Ashes to Ashes. The only thing worthy of mentioning this week so far is that one of my colleagues turned 50 on Sunday and since I seem to have become the resident cake baker at work, I made him a ‘Bayerischer Apfelkuchen’. It’s not complicated to make at all, but tastes great and the cheesecake-like layer in the middle makes it quite rich and moist, so definitely good enough for a birthday cake. I love all kinds of apple cakes, apple pies and apple crumbles and one of the great things is that they easily available all year round. Preheat your oven to 230C/Gas 8. Line the bottom of a springform baking pan with baking paper and grease the sides. In a bowl cream the butter with 75gr sugar and 1/2tsp vanilla extract. Add the flour and mix until combined, the mixture will be a bit crumbly. Press firmly into the bottom of your springform and spread with the jam. Toss the sliced apples with the remaining 75gr of sugar and the cinnamon until well coated and spread over the top of the cream cheese mixture, making sure they get distributed evenly. 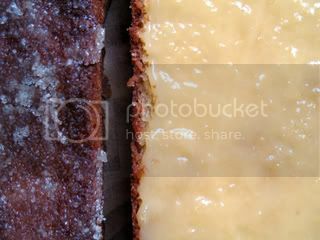 Bake until golden on top and the cheese mixture has set. Depending on your oven this should take 30 to 45 minutes. You can test it with a wooden toothpick. It's been one of those weeks. I've had quite a few late nights at work and as a result not much proper cooking has gone on this week. When it's like that I'm always glad if I have some leftovers in the fridge. I know some people don't like leftovers much, but I do. You just got to be creative with them, so that nobody will actually feel like they are eating leftovers. 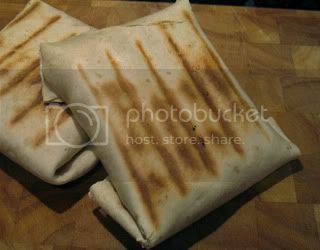 I still had quite a bit of the roast chicken I made on Sunday, so rather than just having the obligatory roast chicken sandwiches, I made some Spicy Chicken Parcels, using my George Foreman Grill on Wednesday night. This isn't really a recipe as such as the amounts vary depending on what's in but I'll try and describe what I usually do. 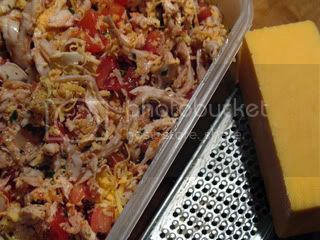 Mix the shredded chicken, salsa, tomatoes, cheese and cumin together. Divide between the tortillas and fold up into parcels. Place seam side down onto your pre-heated George Foreman or Panini Grill and grill for 7-10 minutes. Serve with sour cream or guacomole and a tossed salad. If you don't have a George Foreman Grill (I only do because we were given one by D.'s stepmum, which is actually the most useful present she ever got us, saying a lot about her usual presents, as I only get it out once or maybe twice a month and probably wouldn't replace it if it broke. I know I'm being ungrateful. Sorry.) you can place the parcels seam-side down on a baking tray, brush with a little oil and bake them at 180C for for about 25 minutes instead. The last couple of weekends we have always been eating out, but yesterday we finally had the Roast Chicken that I had been meaning to make for a couple of weeks now. I really enjoy a Roast Chicken and it's one of the things that I usually get right when it comes to roasting, which I can't always claim of my Roast Beef or Pork. Plus, it's got the added advantage that there is always some left-overs for wraps, sandwiches or some other meal and if I feel really frugal I use the carcass to make stock. 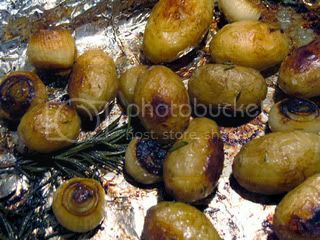 We had it with a side of Whole Roasted Shallots and Baby Potatoes and a simple mixed salad. The balsamic vinegar means that the potatoes and shallots caramelise beautifully, and go a rich dark colour. The first time I made this recipe, I actually thought at first glance that I had burnt them, but it's just the balsamic vinegar. Rinse your chicken inside and out under hot water and pat dry with a kitchen towel. 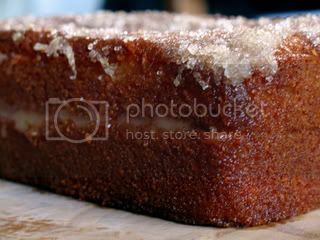 Rub the inside with some salt and pepper and place both lemon halves in the cavity. Carefully slide your hands in between the skin and the flesh through the neck of the chicken, separating the skin from the breast and the top of the legs and thighs, without breaking it. Spread the butter under the skin all over the chicken breast and legs. Place 1/2 clove of garlic and one of the cut up bits of rosemary in between the skin and the flesh on each leg, as well as on each half of the chicken breast. Sprinkle the outside of the chicken with seasoning and salt and pepper to taste. Place breast side up in a high rimmed roasting tray or oven dish and roast for 20 minutes per lb, plus 20 minutes for the chicken. (Example for a 4lb chicken: 4 x 20 minutes + 20 minutes for the chicken = 1hour 40minutes). 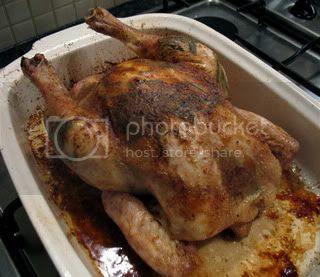 Baste the chicken with its juices every 20 minutes to stop it from drying out. If you have a very large chicken, you might want to cover it loosely with aluminium foil for the last part of roasting, if you feel it is getting to dark. 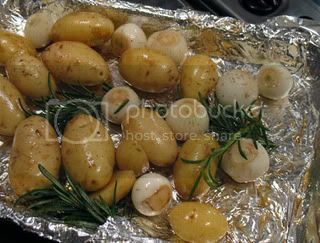 In a large baking tray (you might want toile it with aluminium foil for easier clean up afterwards) mix the olive oil and balsamic vinegar add the whole twigs of rosemary. Add the shallots and potatoes, stir so everything gets coated well. Roast, uncovered, for approximately 1 hour or until the potatoes are tender. Depending on the size of the vegetables and your oven, they might take a little less or longer, start checking after about 45 minutes. Stir once or twice while roasting. I didn't really stick to my plan properly again last week and for this week I haven't bothered making a definite one. I've got some meals in mind, such as Jacket Potatoes, BLT Wraps and Spicy Midnight Soup, but we've got quite a few things on this week and some late nights at work coming up, so I know that I'll probably switch and change things anyways. We did have the Thai Green Curry as planned last week, even though it was on Friday instead of Thursday. I have to admit to buying the ready-made green curry paste that comes in a jar quite often and very rarely cook Thai from scratch, but as long as all the other ingredients are fresh I really don't mind. It's quick, easy and really yummy. The amounts of some ingredients are not measured exactly as it doesn't matter if there is a bit more or less of something. You can also add some julienned carrot and some fresh coriander. Heat a little oil in a wok and stir fry the onion until starting to soften, but not turning brown. Add the curry paste, nam pla and ginger and stir fry for another minute before adding the prawns. Cook until the prawns are turning pink all over. Add the peppers and coconut milk, stir well and cook for another couple of minutes. 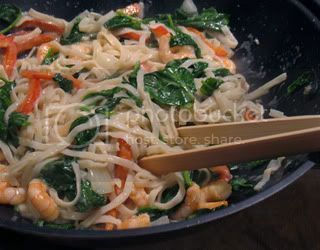 Add the spinach and some cooked noodles (or the Straight to Wok Noodles you can buy everywhere) and stir until everything is heated through and the spinach is wilted. Our students are having a cake sale tomorrow to raise funds for their degree show in June, so this afternoon I made a Lemon Drizzle Cake to donate to it. 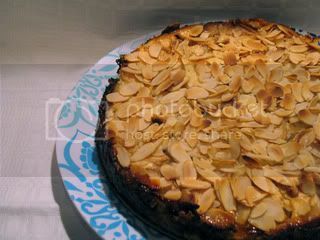 This is my friend Karen's recipe. 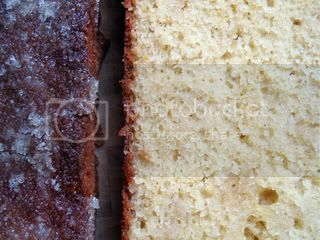 It makes a wonderfully moist cake, with a sticky lemon and sugar syrup coating. The best thing about it is that it is really quick and easy. It's so simple it should be called foolproof, unless of course you are like me. I don't know what's wrong with me today, but when I checked on the cake after about 30 minutes I realised it hadn't risen quite as much as it usually does, which was entirely my fault for not turning the temperature of the oven high enough. No real harm done though. ...and that's excatly what I did as you can see from the pictures. Let's hope it makes a bit of money! Yesterday was Pancake Day here in the UK. You can always tell weeks early that it's coming up as the shops are full of prepared batter, batter mixes and all kinds of syrups to have with the pancakes. It's so easy and quick to make your own pancake batter though, that I don't really get why you'd want to buy a ready mix. 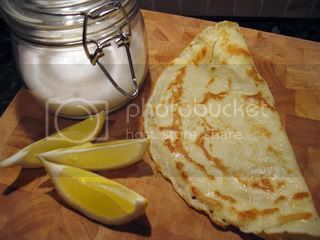 Often when I make pancakes I will fill them with ham, mushrooms and cheese or other savoury fillings, but yesterday we had them just as they are with some sugar and lemon. 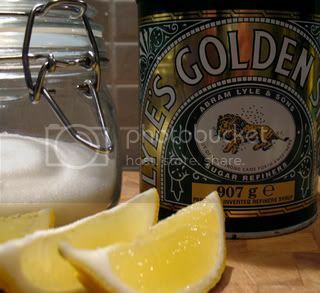 D. also had one with Golden Syrup, but I'm not that keen, so stuck with sugar and lemon. They are also good with sliced apples, cherries or blueberries. Just spread the fruit across the batter as soon as you have poured it in the pan. Mix all the ingredients until you have a smooth batter. You can give your arms a work out by using a whisk or use an electric mixer if you prefer. Ideally rest the batter for 30 minutes. Heat a little oil in a non-stick frying pan and pour enough batter in to cover the bottom of the pan. It should be a little thicker than crepes, but not to much. It's easiest to spread it if you pick the pan up while you're pouring the batter and swirl it around. Wait until the batter starts to set and turn, bake until golden on both sides. Tip for extra light batter: Replace about 1/4-1/3 of the milk with sparkling mineral water. Four Favourite things to eat. 1. I’d rather be on a plane than on a boat. 2. I’d rather be camping than taking a cruise. 3. I’d rather go to Scotland than Benidorm. 4. I’d rather be my age than being a teenage again. 1. Being able to run six miles. 2. Not having to go temping over the summer break. 3. Seeing all my family and friends at Christmas, and hopefully sooner. 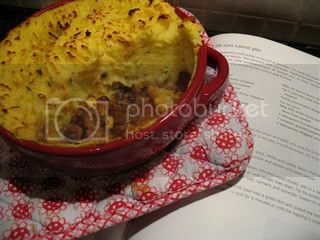 I guess you could call this is a Mexican take on a Shepherd's Pie. I love the way the tumeric makes the potatoes yellow. I'll post the recipe as I found it in Lesley Water's Healthy Food cookbook, but I usually play around with it a little by sometimes adding peppers, or sweetcorn or some chipotle chilies for a lovely smoky heat. Replacing half the meat you'd normally use with lentils not only adds extra fibre, it also makes it healthier. Fry the onion and garlic for about five minutes in a little olive oil over medium heat. Increase the heat and add the ground beef, stirring continuously until browned, about 5 minutes. Add the chillies and cumin and continue to fry for one minute. Mix in the chopped tomatoes, tapenade, stock, lentils and beans and bring to the boil, reduce heat and simmer for about 30 minutes. Stir in the chocolate and season with salt and pepper, if you feel it needs more heat you can add some chilli powder or hot sauce. While the chilli is simmering, cook your potatoes until tender. Mash with the milk, tumeric and cilantro. Season to taste. 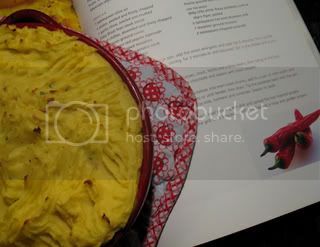 Place the chilli into an ovenproof dish and top with the mash, without smoothing it down too much. Place under a preheated grill for 5-10 minutes until the top is golden brown and crisp. Of course I didn't fully stick to the plan I made last week, but it has still helped and stopped me from nipping out every day to buy some ingredient or other to make dinner. So, I made another plan for this week, doing the shopping list as I went along. Let's see what comes up this week to stop me from sticking to this! Well, the plan was to have roast chicken, but a friend took us out for a Sunday lunch at a local pub. The food was great, I had Steak & Ale pie with roast potatoes, cabbage and Carrots and D. went for the traditional Roast Beef with Yorkshire Pudding, which were followed by Rhubarb and Strawberry Crumble with Custard for me and Sticky Toffee Pudding with Custard for D.
Of course that meant though that we wouldn't have another full meal for dinner and I decided to just quickly throw together some Toast Hawaii. I don't make it very often, but when I do I wonder why. It's so easy and quick and in my opinion rather yummy. I suppose these days it could be classed as retro food. It was really popular in Germany in the 60s/70s. Preheat your oven to 180C/Gas 6. 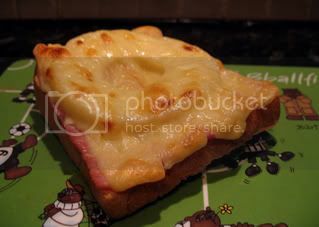 Place the slices of toast on an oven rack and top with a slice of ham, a slice of pineapple and a slice of cheese each. Bake in a preheated oven for 8 minutes. If the cheese is not yet bubly and golden you can finish it off briefly under the grill. If you prefer the bread to stay quite soft you can just do the under the grill, but watch that the edges don't burn. To avoid any of the cheese dripping onto the bottom of your oven and making a mess, place a second rack at the bottom and cover it with baking paper. The Souvlaki was planned for Friday night, but there was just too much of the curry from Wednesday left, so we finished that first and had the Souvlaki tonight. I really like Souvlaki, not only does it remind me of some Greek holidays, but it always tastes so fresh and summery to me. It's a great recipe for a BBQ, but at this time of year I either put it under the grill or I dust of my George Foreman Grill and make them on there, just as I did tonight. I don't know how authentic this is, especially the addition or Worcester Sauce or Balsamic Vinegar, but it's the way I do it. This is an amalgamation of many different recipes, plus own experiments over time. 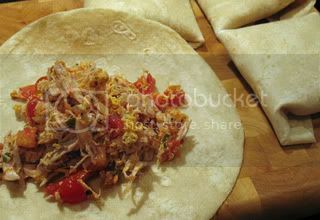 In a bowl or tupperware type container mix together all ingredients, apart from the pork. Add the pork and make sure all of it gets well coated with the marinade. Cover and chill for anywhere between 3-8 hours. Thread onto bamboo skewers (if you soak them in water first, they won't burn) and grill, turning occasionally until cooked. Squeeze extra lemon over the meat once grilled if you like. 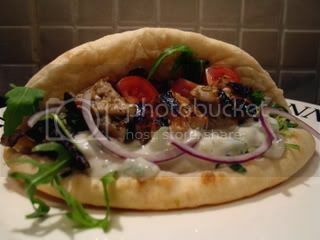 Serve on flatbread or in pita pockets with salad, tomatoes, red onion and plenty of tzatziki.